“What are you going to wear for your wedding?” my Scottish friend Fiona asks me a week before the big date. 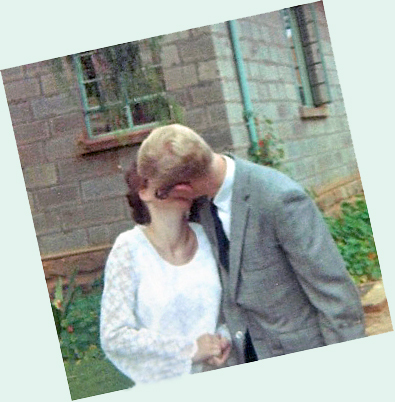 The ceremony is to take place in the District Commissioner’s office in the town of Nyeri where my man and I live in sin in a small house with a lemon tree in front. Fiona’s second husband runs a big ranch and is also a white professional hunter, the kind who takes foreigners on safari for fun and profit. When she comes to town, Fiona brings me fresh produce from her over-abundant garden. What am I going to wear to my wedding? “I don’t know,” I tell her. “I’ll wake up and look in my closet and see what I can find.” Fortunately for me, I have never dreamed of a big, white, fancy wedding. (I hail, after all, from the Netherlands.) My dreams were more about actually being married. To the perfect husband, of course. The dress consists of a short brown skirt below a white lacy top with flared sleeves. “We’ll rip off the skirt and put on a white one,” she instructs. Then she takes charge of the project by bundling me in her car and taking me–plus-dress to town to buy some white fabric and then on to the Indian tailor shop. So that is the story of my wedding dress. The story of my 9-karat gold wedding ring will have to wait for another post. On the sunny morn of our wedding day, my prince and I walk to town together and present ourselves at the District Commissioner’s office for the joyous event. Our wedding party of twelve strong awaits us at the door, an illustrious hippie lot consisting of one Swede, one Brit, a couple of Kenyans and several Peace Corps volunteers, all dressed up in their finest jeans and cleanest shirts. We squeeze ourselves into the small office, a humorless space devoid of festive adornments and full of stale air. Behind the altar desk stands the District Commissioner, a man of solid build and serious demeanor. Also present are two mystery maidens, pretty Kikuyu girls in neatly pressed frocks. We do not know who they are, but soon discover they’re here to serve as our witnesses in case we don’t have any. We do, but the girls do not leave because (I assume) seeing wazungu (white people) getting hitched in this town is not a daily occurrence. It may well be a very rare occurrence because the DC, wearing a suit and tie as is befitting his status, is sweating bullets. Not only from the heat, because along with the sweating he is also trembling and displaying a nervous tick. After various solemn greetings, the ceremony commences. The DC directs himself to my man, ignoring me. My husband-to-be says yes, he does. So do I (this is, after all, Africa), but my understanding is not of importance apparently. My man says, yes, he understands. Ye gods. We are talking about getting rid of me before I’m even married. How cool is that. I’m standing here in all my bridal glory and the DC is talking to my man as if I am not even here. I’m overwhelmed with emotion at this sacred matrimonial moment. I’m sure, dear reader, you can identify. I say yes, I do. Years have passed, but so far no second wife, tribal or otherwise. NOTE: This wedding was not a recent event, and I am sure that the ceremony I have described has been changed and modernized. So if you want one just like it, you are out of luck. So, dear reader, do you have a wedding story? Were you sold for a couple of goats perhaps? Or bought for a camel? Pray tell! funny post. You have a way with words. Thanks for stopping by! Being in the wedding business, you must have a fun career! I love your story! We wed in Las Vegas. We both have divorced parents who hate one another. Eloping was the right thing to do. I found your blog by Googling my first name, although I can’t find where it relates to your blog. I find this such an interesting blog….I am glad Google led me here…..
Google is a treasure chest. You never know what you’ll find. Sometimes not what you’re looking for. I’m glad you like my blog. I’ll check out yours. Enjoyed the story, thank you. @ mae, Thanks for the compliment. I’m happy you enjoy my stories! What a wonderful wedding story! As someone who just got married herself, it’s always amusing to see how weddings are done in other countries. Came over from Vitgin Bloggers… that post is going on forever. Keith, I too came over from Virgin Bloggers – I needed to cool off and lie down for a while! Now this is the funny part – I was born in Kenya! Thanks, Keith. In traditional societies like many in Africa, multiple wives are the norm, but when the countries westernize their laws they have to make very sure people understand the difference. Of course that is why we got the spiel. Well, my groom did 😉 Thanks for dropping by. Arvind is still looking for number one, but who knows, if he wants more he can always move to Kenya! I was married at City Hall in Canada in February, wearing black boots to keep my feet warm. We waited outside the JP’s room where petty criminals were waiting for their hearings that morning. Homeless people were coming in and out looking for cigarettes discarded in the ashtrays as people were either called into their wedding or their hearing. The assistant told us we needed fifteen dollars-exact change- before we could proceed. The JP said my name wrong on all tries. By the way, I was born in Nairobi, named after Chania Falls. Chania, I was also born in Nairobi! My wedding story isn’t as ‘interesting’ as yours, although the venue was quite impressive–out on the Tasman sea among a few friends, some gulls and a sleepy seal or two! I’m so happy to hear your the No. 1-and-only wife. But I have a question, was your presence even required for the civil ceremony, when it seemed to be all about him? It’s a good thing, I guess, that your daughter didn’t want to get married in her mother’s wedding dress! Great story! After being ignored at your own wedding, you’d have been well prepared to shop for a car in the US. Or to present your expert opinion during a business meeting. Or…oh, never mind! I believe most of those things are much-improved these days. That is great! Thanks for sharing 🙂 Stopping by from BPOTW have a great day! @ Doris, what a great story! It’s always fun to hear of other people who’ve had unusual weddings. Maybe that sort of experience makes you bond even more. @ Cathy, you are well and truly married with two ceremonies! Wow… what an experience! I had two weddings – both to the same (and still current!) husband. One here in Germany at the town hall, and one (a service of blessing) in church in Britain so all my elderly (and not so elderly) relatives could make it too. I love how the whole official “transaction” part of the wedding goes down as if you are not even standing in the room! You must be pretty special to have made it past the temptation of tribal wife #2. Great story. I take it you weren’t allowed to take an extra husband under tribal laws then? A Moroccan rug salesman proposed to me and offered 500 camels and described the extravagant 7-day wedding we would have, all the while stroking my arm. But I think he just wanted me to buy a rug…and also his teeth were bad, which was unacceptable to me (I’m an American), so we never got beyond me not buying a rug. Now you make me want to write about my wedding experience in Kauai. Sometimes I wonder if we’re not related. We do have to meet one day. Please bake me some bread when we do. I’ve only ever been asked. Three times. First by a man about 30 years my senior (but he only had dirty things on his mind and I was only 19). Then by a man who was about 30 years my senior (but he only wanted the money. Which I didn’t have, I was only 22). And lastly by a man who was three years younger (he lived with his mum and he was very drunk. I was 22). Oh, this was funny! Just think: if you had had a traditional wedding then you wouldn’t have had this great story to tell. Very amusing, as always. Thanks for this.